The final part of the AAR: the assault into the village. The 2nd and 3rd Sections start the assault on the village. SPOILER ALERT: This scenario is going live at the Battlefront's repository within the next 48 hours. If you are going to download and play this scenario, this AAR may spoil your playing experience. The untenable high ground which costed me an LAVIII (the crew survived) had to be abandoned for good. It was right in time for the final assault onto the village, where the LAVIIIs were needed for close support of the infantry. Crossing the open terrain near the village was relatively easy because of the great supply of firepower provided by the LAVIIIs. Still, the infantry suffered two more casualties during the approach. The 1st Section, which was left covering the village's main approach route was then tasked with clearing the irrigation ditches in front of their position. They couldn't find those pesky RPG teams that harassed our LAVIIIs up in the hill, but eventually they found their way into the village and secured a foothold in it. The final minutes of the scenario were spent clearing out the village. Even for a tiny built up area like this, it is intensive work. We suffered more infantry casualties here. Another scene from the village-clearing operation. 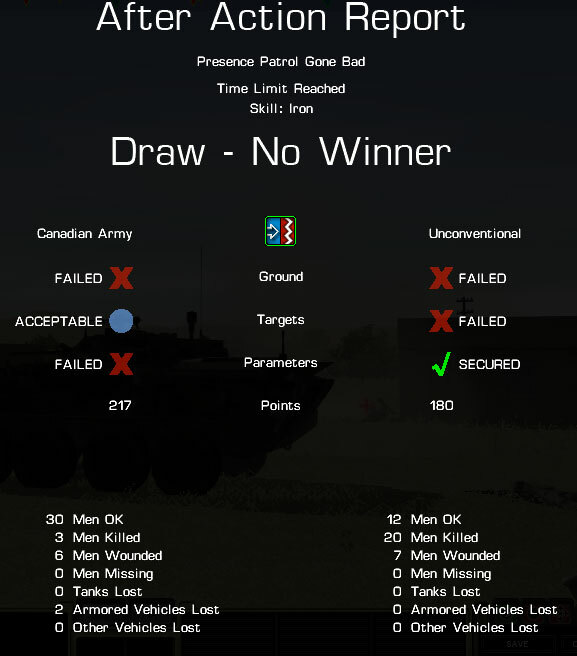 A single man from this enemy team survived, hid into the house and managed to fire an RPG into the LAVIII that was following the infantry team. Nasty stuff, at the last second before the end of the scenario. The final score. We didn't manage to completely clear the village (ground objective for both the insurgents and the Canadians), but at least we denied the enemy complete possession of it. We suffered way too many casualties and that affected our parameters score. Casualty recovery severely throws off the timely advance of infantry. I purposely tried to keep each section in place after it suffered a casualty so the injured could get first aid and survive. A good practice is to split teams and leave one of them taking care of the casualties. The LAVIIIs had little to offer in terms of detection and early warning to the infantry. Most of the times it was the dismounts spotting targets for the LAVIIIs. The LAVIII's transition from overwatch to close support was inordinately long. There was no forethought about how to proceed with more expediency in the case of enemy contact. One alternative would have been to rush the LAVIIIs forward towards a covered position and have them fight their way out from there with help of their firepower. Reading about how the infantry had to spot targets for the LAVs, I think many wargames treats modern armored vehicles like they are WWII tanks, with very limited visibility through narrow vision slits. Thermal sights, powerful optics and other improvments in sensors and situational awareness for vehicles seems to be forgotten. I think simulators like Arma 2 and Steel Beasts are much better at showing the advantages of modern vehicles over infantry over exended ranges. I think it's modelled this way in CMSF because of the limited size of the maps. It ends being a realism/gameplay compromise. Concerning Arma, I hope they put some kind of "armor calculations" on Arma3, currently it's a kind of HP based system. Even with humans crewing a vehicle, the visibility can still be terrible. You're only as good as your best set of eyes, thermals and optics being just tools to help you see. It's pretty easy to think that since we've got optics and sensors that can detect an Iraqi tank regiment before they know we're even within 10km but when you apply the same logic to thirty irregulars, you've got an entirely different ball game. Let's consider putting the LAVs into a situation with enemy vehicles--those LAVs will most likely pick up on those targets pretty quickly. They're a big, loud, hot target that'll show up on their optics and sensors. So yes, in that scenario, I'm sure that the LAVs would see plenty of action against those targets--But not against infantry only. More importantly, if the infantry in question hide in good cover and concealment, high tech gadgets aren't going to give you complete and total knowledge of what's going on at all times. There are a few options for you ranging from simple to confusing. There was a Tank Damage System addon released around the time Arma 2 launched that adds penetration values to armor instead of the HP based system. Then there's the more complicated ACE2 system that factors in the area hit, the angle of the hit, the round, the thickness of the armor, etc. Excellent post. Looks like a tough fight no matter how you look at it--the terrain's pretty flat. I might try it myself, though that this was your second playthrough I worry that maybe you took the right flank the first time and got sent packing. Hi gents and many thanks for your comments. @ Johan and SacaSoh, it certainly feels like the sensors are dumbed down somehow. I will try something similar with the ASLAV in Steel Beasts ProPE. As Desdinova say, sometimes one tends to overrate the thermal sensors. I will be thrilled if you can play the scenario. It requires the NATO module (Canadian forces), but let me know if you don't have the module. I can change the OOB to a USMC recon force. Is the scenario up at Battlefront already?